Clearly, I thought that the Dictionary Girl’s needed to get a little more rough and tumble…. so here they are… rough and tumbling (Is it just me or does that sound like a sexual innuendo?). I feel as though I need to say this, since I seem to get a lot of comments or questions that start with an apology- Please ask me question. Please make requests. Please feel free to inquire if I’ve ever done a style or a kind of paper doll. I will respond. I might take a few weeks days but I do try to get back to people. Not promising that I’ll do a certain style of paper doll, but I try to reply as much as I can to comments and am grateful for everyone I receive. I just thought I should state that somewhere. On a fairly unrelated note, it is Speak Like a Pirate Day, so I went in search of a few pirate paper dolls. The pickings were not impressive. 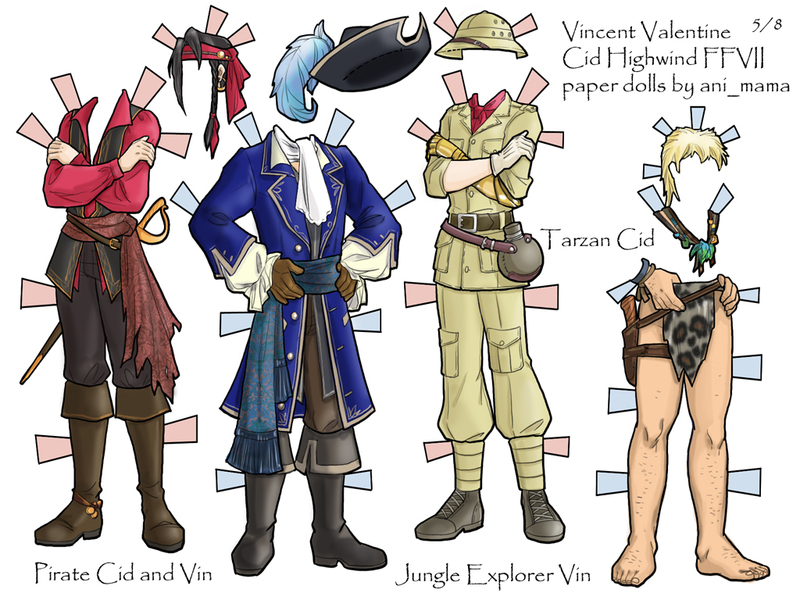 Final Fantasy Paper Dolls Made by Animama depict several of the Final Fantasy characters (none of whom I confess I know), but have some stylish pirate wear and fair number of other tongue in cheek outfits. Lady Pirate Paper Doll depicts a beautiful black and white winged lady pirate. 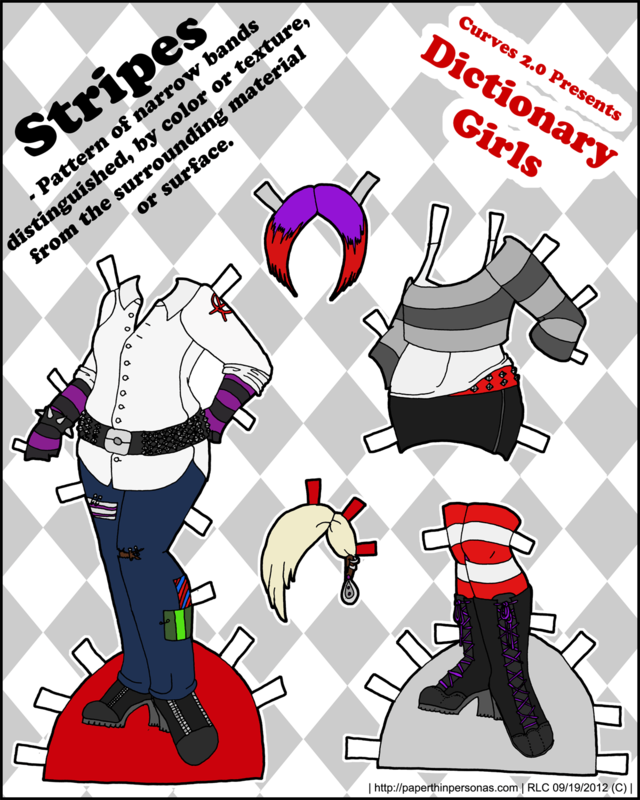 There are other printable paper dolls as well. These guys feel totally Easter like to me… I think it’s the spring green and the yellow. Speaking of archives, (see what I did there? I’m proud of me), I am nearing my 350 posts mark which I think is entirely more exciting than it really aught to be. 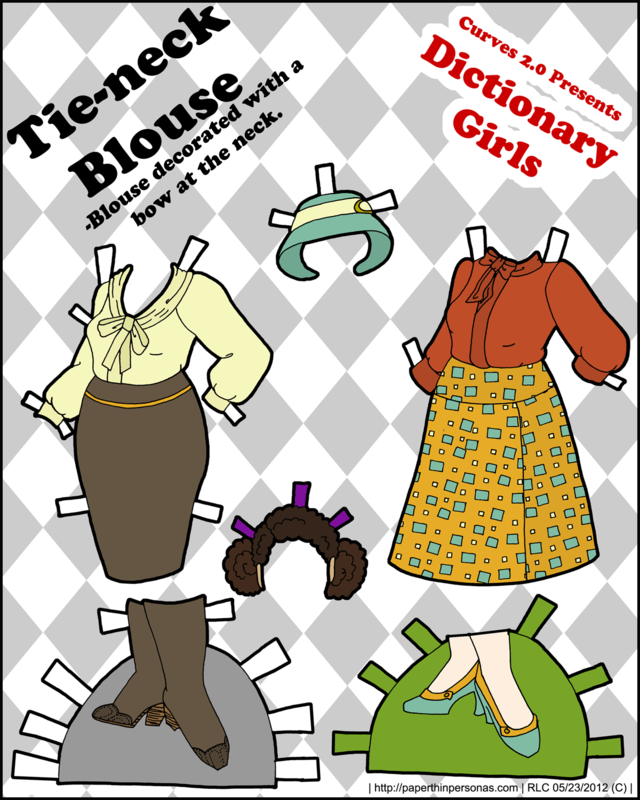 I really like clothes more than dolls when it comes to paper dolls, but I have gotten curious how other people feel. Hence… A POLL! Today’s Dictionary girl is a take on neo-Victorian things. I’m not entirely pleased with the drape on the skirt… but I decided to go for it. I do really like the hair and the boots. I think I’ve mentioned I have a thing for boots. Since she won, it seems only fitting to answer her question. D. Garrett asked, Have you determined if any one of your paper dolls is more popular than the others? Yes, I have. My most popular paper doll is Marisole Boldly Going which has had nearly four times the number of hits of any other paper doll I’ve ever drawn. Closely following Marisole Boldly Going is my first Marisole in black and white Modern Girl in Black and White which I drew in response to requests for a black and white Marisole paper doll. In general, Marisole is my most popular paper doll. That’s all neither here nor there. 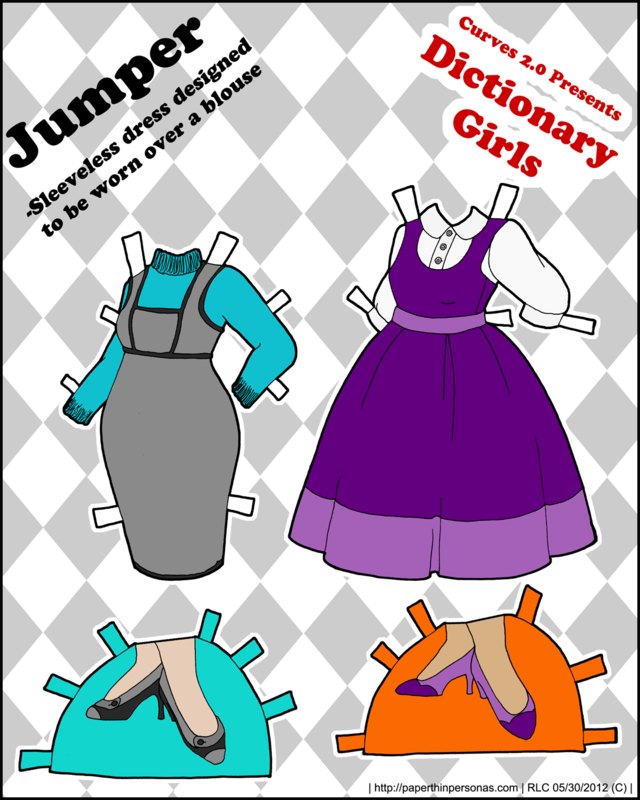 Today, our printable pin-up Dictionary Girls get jumpers. Nothing terribly fancy, but I needed to do something simple and I wanted to get it done, so here they are. I’m fairly pleased with how they came out and very pleased that last week I managed to get a full week of paper doll posts up. Hopefully, I can do the same this week. I have everything ready, I just need to post it. Kate asked: I loved your Esther doll, some time back, and was wondering if you were up for doing any more biblical costume dolls. At the moment I don’t have any more biblical costumed paper dolls planned. 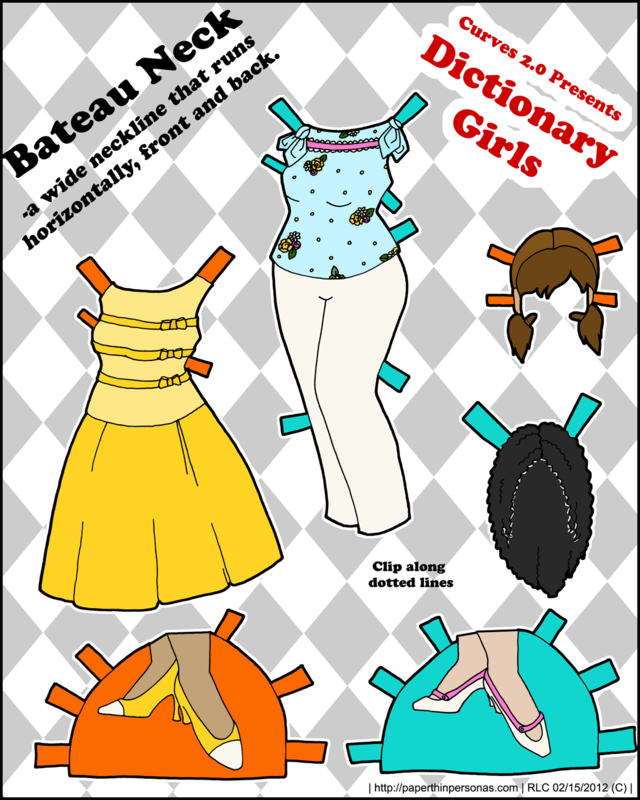 Ester was done for Purim, since it seemed fitting to do a paper doll for a holiday where children dress up, but I can’t really imagine doing a paper doll for another Jewish holiday. Not only because I can’t think of a tie in, but because I discovered that ancient costume is really hard to research. However, I know Toria over at Paper Closet has discussed doing a Women of the Bible series and Toni on her blog has a Christmas and Hanukahh Paper Dolls including Mary, Joesph and a Jacob. They’re full color and have wonderful faces. And on a totally unrelated note… Flat Doll is the website of the wonderful artist Kwei-Lin Lum whose work is surreal and beautiful and artistic and sometimes dark and sometimes playful and always interesting. And it’s just recently been updated after a long silence. Kwei-Lin Lum is one of the only paper doll artists who really seems to engage with the idea of what the medium “paper doll” or as she calls them “cut outs” can mean for transformation art. Seriously, her artist statement is inspiring and humbling. She’s done three books for Dover- bi-lingual Day of the Dead, the rather dark Twisted Fairy Tales, and the slightly tongue-in-cheek Voodoo. If you have a question for me and you want me to answer it? Ask it and enter my drawing. The thing I like about the Dictionary Girls is that they have very few outfits per post. And I enjoy getting to color retro inspired clothing, though I have plans to expand into some other styles in the future for them. Tie neck blouses are a fashion stable, even I own a few. The truth is that I “rediscovered” this set of paper doll clothes under another pile of papers on my desk. I am not a terribly organized person. I try to be. I’m a librarian, so people always assume I’m organized, but the truth is that I live in a pretty much constant state of chaos. I love watching home decorating shows, because I admire people who are organized. The truth is that I am surrounded by piles of papers most of the time. I live, at the moment, in a tiny graduate student apartment and the result is that my desk (and often my couch) is covered in piles. I try to at least clean up the piles once in a while, sort of through them and look at what is stacked up. On any given day, I might have old drafts of school work, half finished letters to family (which I write and then forget to send.. a bad habit) and then, of course, paper doll things. I collect around me things for ideas. I’m always low on them, so I need to have inspiration at hand. I buy fashion magazines and also those hair style magazines. I usually have a few rough drafts of doll poses and xeroxes of dolls in need of clothing. My world is full of fragments of this obsessive hobby of mine. 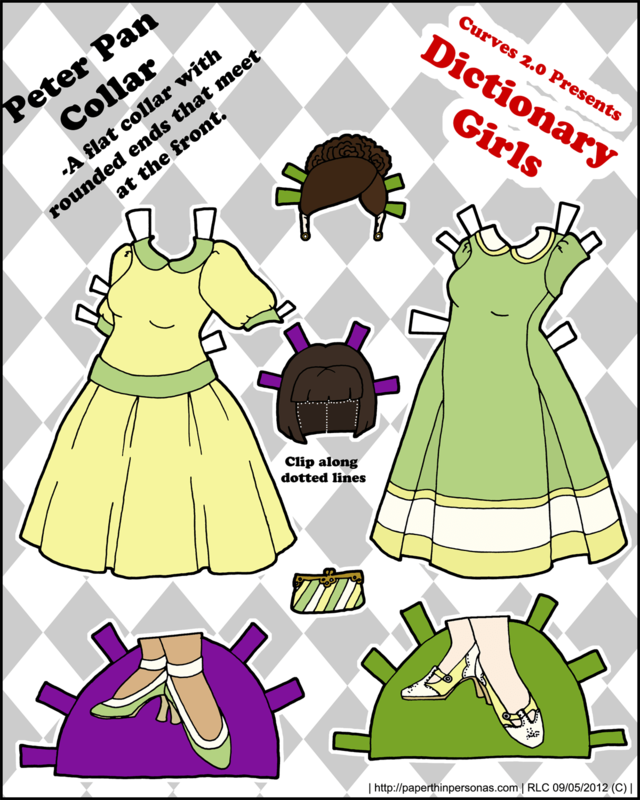 Today’s Dictionary Girl paper doll was colored after a friend of my friend complained that I didn’t have enough brunette pale-skinned blue-eyed paper dolls like her and she thought this wasn’t fair. Well, there is some truth to her remark, since I tend to favor variety of skin tone over variety of hair color. That all began when I realized the internet was full of printable paper dolls and they all seemed awfully white. Still, when a someone demands a blue-eyed brown-haired paper doll, and when they live in the same apartment building, it seems hard to refuse. So, here is Fleur. She has the same skin tone as Alyssa and therefore can share shoes with Alyssa though I can not promise wigs will work since they have two different hair styles. What sort of coloring would people like to see for the next Dictionary Girl? Not much to say today (and not a lot of time to say it in), we’ve gotten some snow this week that has stuck to the ground for a little while and I’m enjoying it while it lasts (the temp is supposed to rise again and I suspect it will all go away). I spent most of my spare time these last few days revising my drafts for my MA thesis (oh, what fun…) and working on other things then blog stuff. Blog stuff gets to go to the bottom of my list. I can squeeze out drawing time easily enough, but coloring, cleaning up and posting time is a hot commodity these days. Someday I should calculate how long it takes me to get a paper doll done and posted, but I suspect it would just depress the heck out of me, so I think I won’t bother. 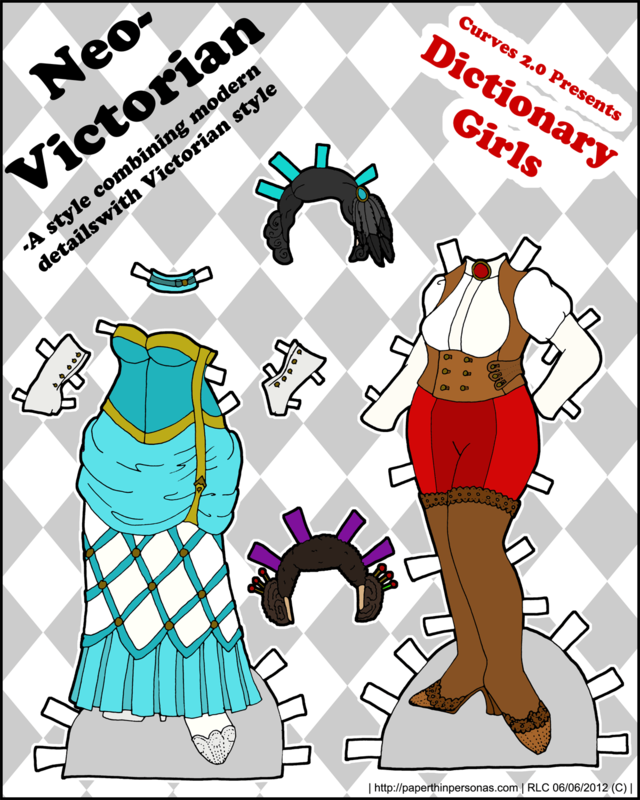 Anyway, I barely got this done before the end of Wednesday and I am very excited to present these outfits for the lovely, curvy Dictionary Girls. Now, I’m off to bed.